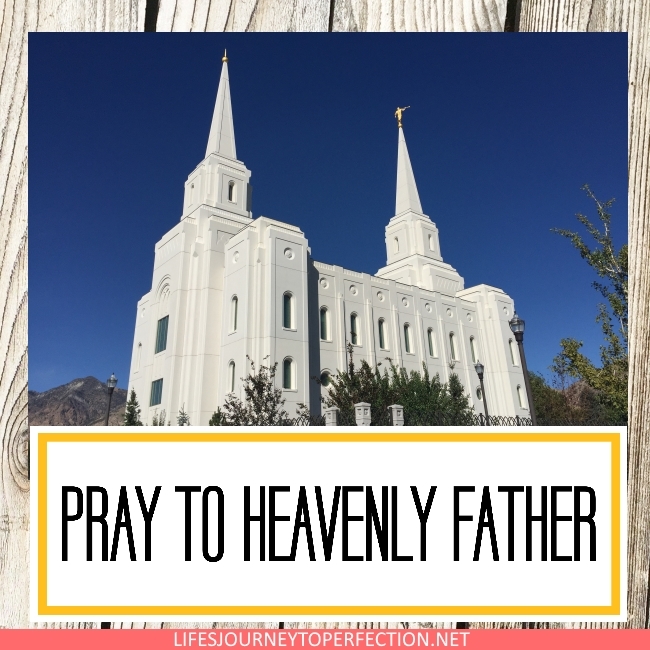 Life's Journey To Perfection: 2018 Primary Sharing Time Ideas for July Week 4: Heavenly Father wants me to marry in the temple and have an eternal family. 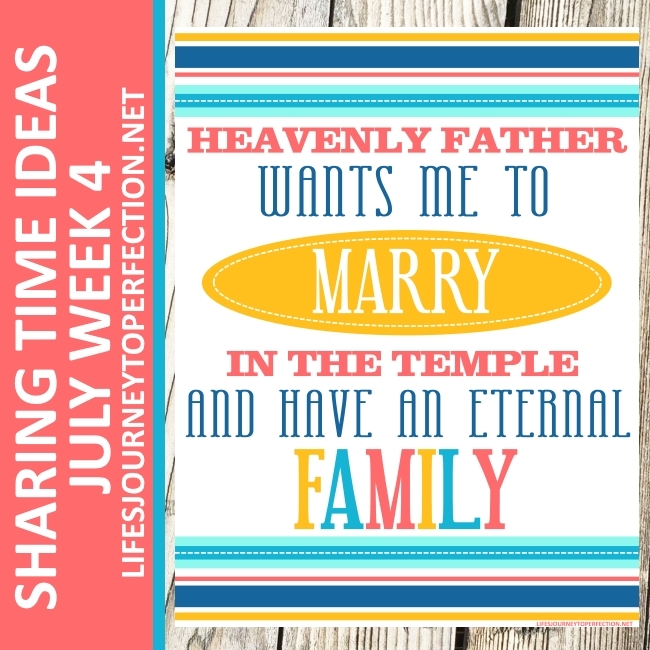 2018 Primary Sharing Time Ideas for July Week 4: Heavenly Father wants me to marry in the temple and have an eternal family. 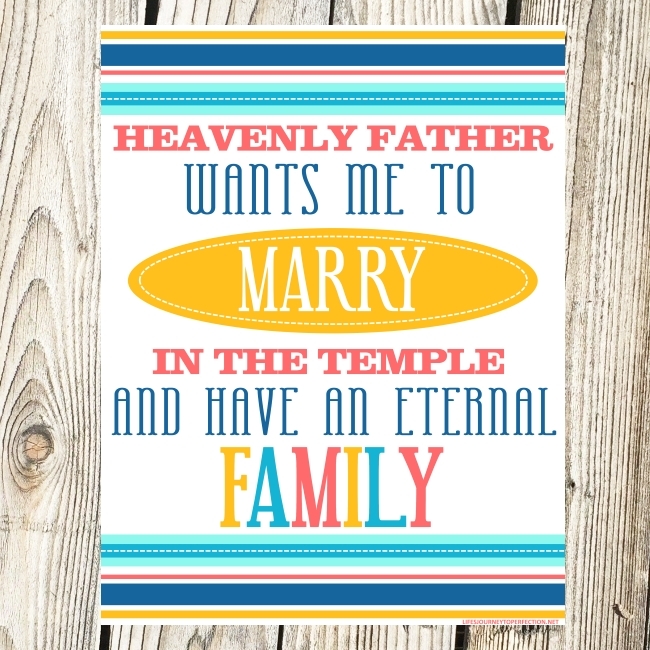 July Week 4 Topic: Heavenly Father wants me to marry in the temple and have an eternal family. Begin Sharing Time by inviting the primary children to sing, "I Love to See the Temple". Show the primary children the theme poster and invite them to repeat, "Heavenly Father wants me to marry in the temple and have an eternal family." Explain that we receive great blessings as we marry in the temple and have eternal families. Read this quote from lds.org "Life’s greatest joys are found in the family. Strong family relationships require effort, but such effort brings great happiness in this life and throughout eternity. In our Heavenly Father’s plan of happiness, a man and a woman can be sealed to one another for time and all eternity. Those who are sealed in the temple have the assurance that their relationship will continue forever if they are true to their covenants. They know that nothing, not even death, can permanently separate them." Explain that as a primary you are going to do any activity that will help us understand the things we can do right now to prepare to marry in the temple and have an eternal family. Hide around the room pictures of temples on the backs of the temples print and attach the word strips (see free download below). Invite a primary child to find one of the temples. 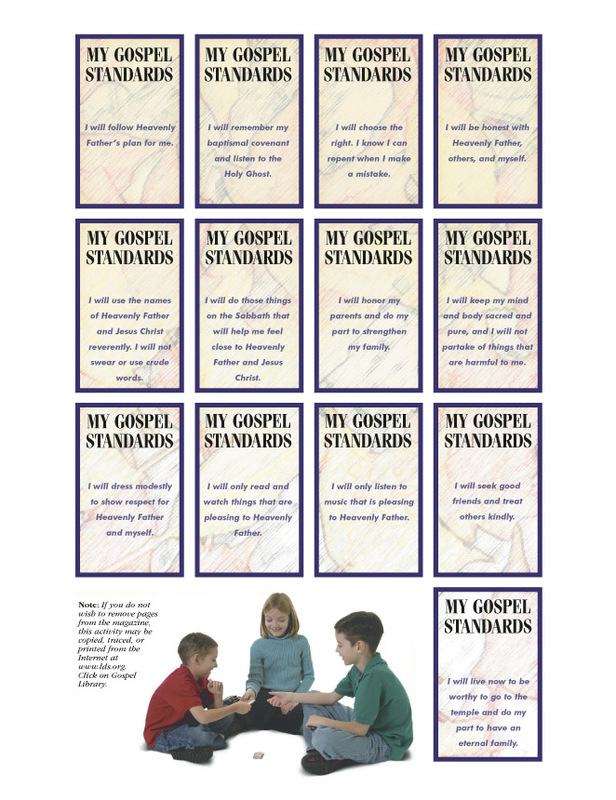 Read the word strip on the back and discuss as a primary how that principle can help them prepare to marry in the temple and bring blessings into their lives. Continue with each of the temple pictures and word strips. Close by sharing your own testimony of the temple and the blessings that come from and eternal family. 2018 Primary Sharing Time Ideas for July Week 3: The priesthood can bless and strengthen my family. I made a sheet with the picture of the temple and a place to write each of the 10 subjects we will talk about for the kids to fill out (like taking notes) and then take home with them. Thank you for all the great ideas for sharing time!